DHL is one of the popular shipping carriers that you can use to ship your WooCommerce store products. If you have a DHL account, you can use the ELEX WooCommerce DHL plugin to automate the integration of DHL Express, DHL Paket and DHL eCommerce. The plugin helps you display various DHL Express services on your cart and checkout pages along with their real time rates. You will be also able to print shipping labels and get assistance for box packing with the plugin. In this article, we will discuss how you can manage WooCommerce shipment tracking using DHL Shipping plugin. When you create a shipment using the DHL plugin, you will find a tracking code generated as well. In addition, if you have enabled order completion emails on your settings, the tracking code will be automatically sent to the customer along with the order completion email. The order completion email is sent when you change the order status to ‘Completed’. When the customer receives the order completion email, they will also get the tracking code included in the mail. With the help of this tracking code, they can accurately track the whereabouts of their shipment till it reaches them. What are the benefits of providing shipment tracking to customers? Shipment tracking is one of the important aspects that ensures a smooth fulfillment. When you provide tracking information to customers, they are more informed on the whereabouts of their products. Let’s take a quick look at how shipment tracking would add several benefits to customers on your WooCommerce store as well as to store owners. When you choose a shipping carrier, you are entrusting them to get your products safely and promptly to your customers. So, it plays an important role in the successful progression of your business. With accurate tracking, along with the customers, you will be also able to see the different stages of transit. This would enable you to have a clear view on how the shipment is being delivered to customers. If there are several cases of delay, you can take a look at the different checkpoints during transit, and understand the flaws in the delivery channel. Basically, this kind of knowledge would help you take appropriate actions if there are any recurring problems with your shipping carrier. Moreover, this will help you take economical decisions that would help improve your overall earnings as well. The aspect of better visibility also provides scope in improving the shipping process. A lot of carriers offers notifications to be sent to shippers as well as receivers. This would enable you to promptly notify customers about any delays in shipping. Moreover, in specific cases, you can take timely actions as you are aware of the delay well in advance. For example, if there is a delay in an urgent shipment, you can divert the shipment by making use of another faster service. Or, take the input of the customer and make an alternative delivery plan like picking the shipment from a different location. Such efforts would considerably improve customer experience on your store. A large percentage of eCommerce customers consider shipment tracking as an important aspect of their delivery experience. Being able to know the whereabouts of their order offers a lot of peace of mind to customers. Overall, providing tracking information helps to make customers trust your brand. There are more chances for satisfied customers to come back to your store for repeat purchases. Here is a quick look at some of the additional features you will find while using the ELEX WooCommerce DHL Plugin. You can display multiple domestic and international DHL Express services and their real time rates on your cart and checkout pages. The rates displayed will be based on the weight and dimensions of items in the order as well as the shipping destination. Your customers will be able to choose the preferred service according to their specific needs. Integrates with DHL Express, DHL Paket and DHL eCommerce services. 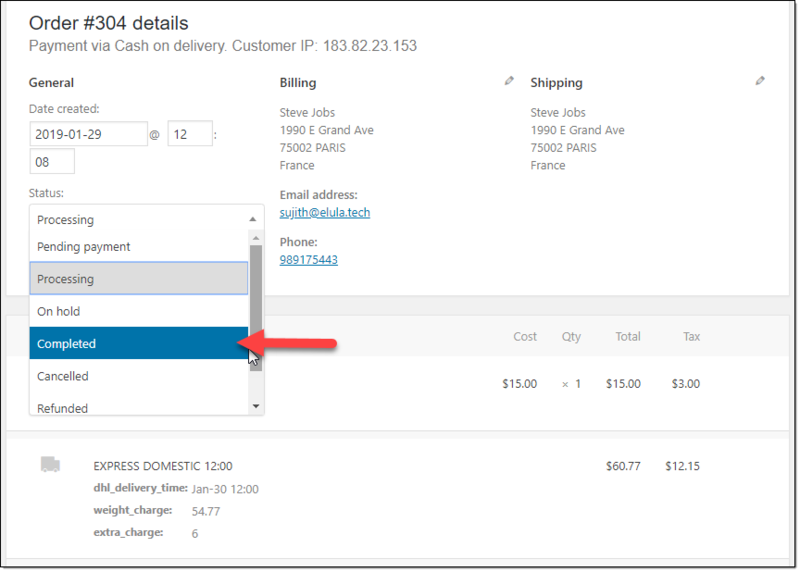 To display rates on the cart and checkout pages, you will have to use DHL Express. You will be able to make price adjustments to shipping services according to your store’s specific requirements. The plugin allow fixed amount or percentage adjustments to be added to each specific service. There are three options available for box packing with the plugin. You can choose from ‘pack items individually’, ‘pack into boxes with weight and dimensions’, and ‘pack purely based on weight’. The plugin helps you print international and domestic shipping labels complying to all applicable shipping regulations. The plugin even have specific settings to help ship dangerous goods or hazardous materials like perfume bottles. You can choose the appropriate shipping service before printing the label. And, the plugin ensures the payment of postage is paid automatically using your DHL account. Being able to process returns smoothly is another important characteristic of an eCommerce store that customers pay attention to. With the help of ELEX DHL plugin, you can easily print return labels as well. When you print return labels, you can choose specific items for returns from an order consisting of multiple items. The plugin helps to print archive air waybill as well. You will be able to attach a copy of way bill to shipment labels as well as return labels. Offers DHL Paperless Trade (PLT) feature to print soft copies of commercial invoice to be sent to customs via DHL. Even domestic parcels to military bases would require a commercial invoice. So this feature might come in handy for your domestic and international shipping needs. To understand the features of ELEX WooCommerce DHL plugin, please read the documentation or try the live demo. For any queries, please contact our customer support team.